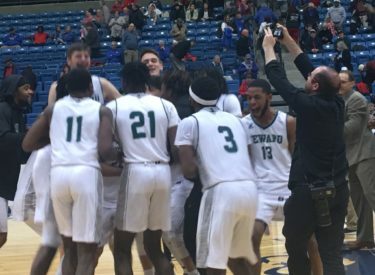 Seward County Community College basketball players continue to receive recognition and honors for their tremendous seasons. The All-Region VI teams for both men’s and women’s basketball teams were announced on Monday and, not surprisingly, Saints and Lady Saints made the list. For the Saints, Isiah Small was named First Team, Montrevion Flowers made Second Team and Reggie Miller was named Honorable Mention. This past season, Small averaged 6.7 rebounds, 1.8 blocks and 1.3 steals with 14.7 points, Flowers averaged 11.4 points and 3.7 rebounds and Miller averaged 10.2 points, 3.2 assists and 3.6 rebounds. For the Lady Saints, Silvia Veloso was named First Team and Carla Covane was named Second Team. Veloso averaged 13.6 points, 3.6 assists and 3.6 steals and Covane averaged 12.1 points and 8.8 rebounds this past season. Earlier this month, all five players were recognized with Jayhawk West/Conference honors. Small was Defensive Player of the Year, and First Team All- Conference. Flowers and Miller were named Second Team All-Conference. Veloso was chosen Player of the Year and both Veloso and Covane made First Team All-Conference.